UpCode will deliver an optical sensor integrated to 2D code to ABB. This delivery also includes a mobile app for optical recognition to smart phones. The goal of this project is to follow heat sensity of electrical components. Listen to Sture Udd and his thoughts about the new Wasa Innovation Center (in swedish). UpCode participated to the final conference of E12 Atlantica Transport Interreg 14-15.3.3018. The E12 Atlantica Transport project, crossing the boundaries of the borders, is in the final stages, and has been moving ahead with the most advanced co-operation in the Nordic E12 transport chain. UpCode has delivered and implemented a self-service solution where customers interact with a point of sale using their personal ID. Now system is extended to support Mobile payments and codewallet functionality. Customers can use Jäkälä Mobile App when customers interact with a point of sale. Perämeren Jätehuolto (a Finnish waste management company). The cards will simplify payments for 60 000 customers in their region. Their region being consisting of the cities Kemi, Tornio and the municipalities Keminmaa, Tervola and Ylitornio. New features for a mobile information collection system. Employees work hour data is now easier to point for correct costpools. This give more accurate data directly. Maintaining and editing improvements for employees, supervisors and payroll department prosess. 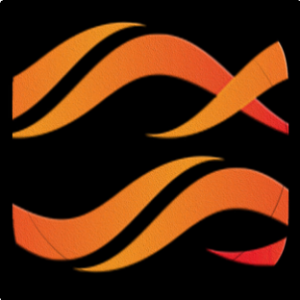 The “Vaasa Citylife” app by UpCode is now available for download in Google play and the Apple appstore. The initial usage trial have started. The UpCode reader now supports up to 3 different sensors on one Smart Tag! With functional inc becoming increasingly common, being able to interpret and store sensor data for analytics is a great opportunity for the industry. 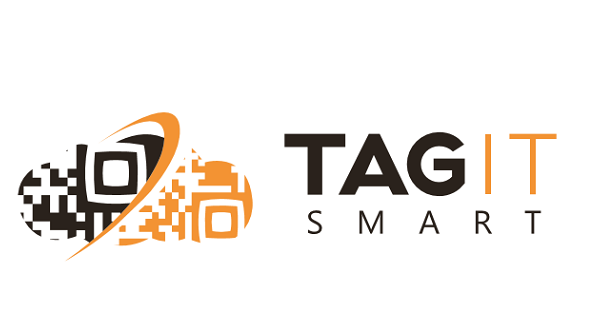 UpCode is a Partner in TagItSmart project (http://tagitsmart.eu/). In this project we are developing optical tags and IoT solutions, which can be used in many ways in various functions (e.g. tracking Product Lifecycle). 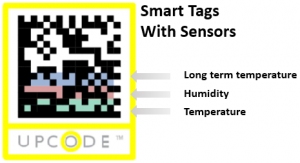 These tags can be combined with sensor features to monitor the environment of the product. This MeetUp event is hosted by UpCode and VTT. MeetUp event is free of charge, but registration is needed. 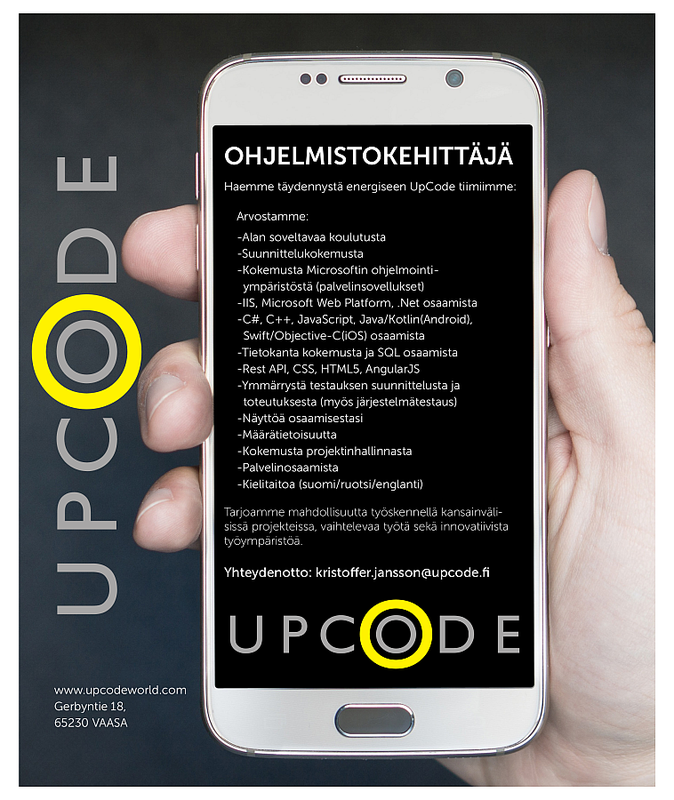 Please register your participation by 1.9. to Pekka Liedes, pekka.liedes@upcode.fi. All presentations are in English. If you need more information about this event or TagItSmart project, do not hesitate to take contact. Construction of Innocenter has started. The idea is that the whole EGTC region (0,5 million people and 100.000 students) of Vasa-Umeå will benefit from the project. It will be "The Place" where digitalization (both automatization and disruptive innovations) are implemented in workprocesses, transactions, logistics, administrations, healthcare and education. The Center will help companies, individuals and start-ups conquer the world. Literally, but also in heart and mind. The idea is to create new professions and future jobs where digitization with AI (Artificial Intelligence) is at the center. Meteoria Digi-Journey, a virtual guide based on UpCode Mobitour has been implemented at Meteoria Söderfjärden. By simply scanning the site codes with their phones, visitors receive information about the Tellus timeline and Big Bang. There is also as some interesting details and pictures of the machinery at Södersund windmill. In addition to improve service in their own language to visitors outside opening hours, Mobitour also gathers vital statistics about popular visiting times and language of visitors to further help develop Meteoria as a tourist site. Meteoria is a visiting centre, maintained by Sundom bygdeförening (voluntary association of the village of Sundom), located just outside Vaasa in the middle of one of the most beautiful and best preserved meteorite craters. The area is also popular for its bird life. Successful on-site demonstration and commission of the mobile TR-mittaus reporting tool (UpControl), by state inspectors on February 2017. Talking Tools educational mobile system (UpSkill) now being tested in schools in the city of Vaasa 2017. In addition that each UpCode is unique, each UpCode has a sensor which reacts to different conditions. Now every item can monitor variables like temperature, humidity, time or light, and provide valuable information to stakeholder. items current or past conditions. TagItSmart is off to a good start. With the conclusion of the recent project meeting on 25-26th of October, all partners were able to present their results. Our “Digital Beer” case was presented on this occasion, demonstrating to companies the possibilities of a Digital Product. Read more info about Digital Beer. The Federation of Finnish Enterprises arranged their main event for the year, the National Entrepreneur Days, in Vaasa during beginning of October. The event had a participation of 1300 entrepreneurs. UpCodes UpFair solution was used for participant identification and information gathering for exhibitors. 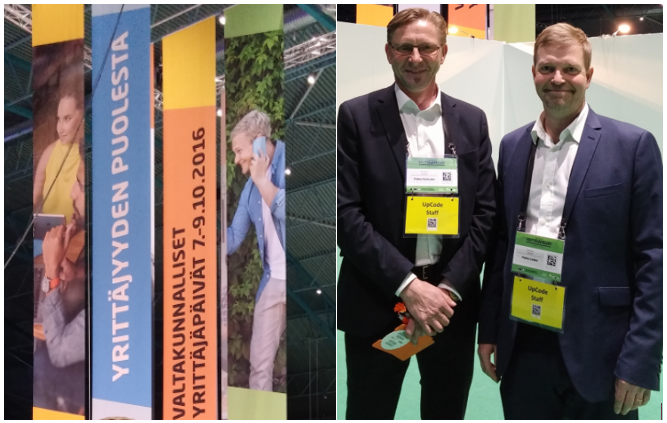 Pekka Karhunen and Pekka Liedes for UpCode explains the different options of the ID-solution. 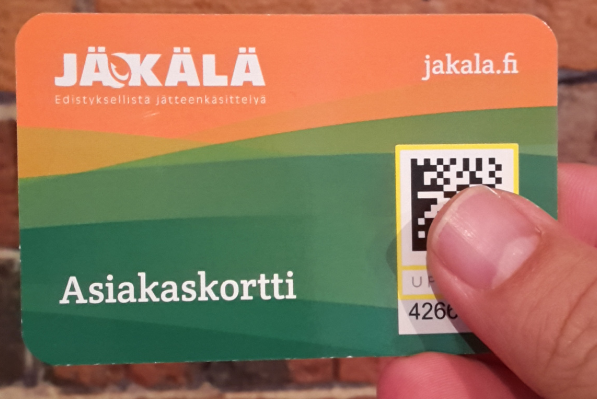 Perämeren Jätehuolto (a Finnish waste management company) has now started to use the new customer cards. The cards will simplify payments for 60 000 customers in their region. Their region being consisting of the cities Kemi, Tornio and the municipalities Keminmaa, Tervola and Ylitornio. Starting 1.9.2016 customers will use cards backed by UpCode technology when conducting business with Perämeren Jätehuolto. UpCode has delivered and implemented a self-service solution where customers interact with a point of sale using their personal ID. Pekka Liedes, Operations Manager joins the Upcode Team. Pekka has aquired extensive experience, holding many different positions during his 20+ years in the IT industry. UpCode held a successful training day for Kouvolan Vesi and customer is now ready to use new UpTrack-system. H2020 funded "TagItSmart" continues its work to bring "Internet of Things" to the masses. 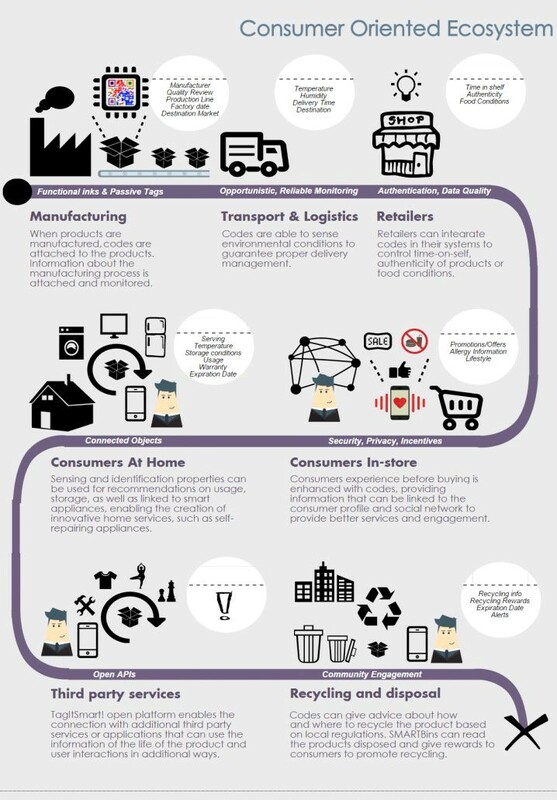 Enabling connected consumer products. A project group meeting was held in VTT premises (25-26.5) which focused on finalizing the use cases that are to be implemented during the three year project. Technical approaches were discussed and planned engagement for ecosystem building. 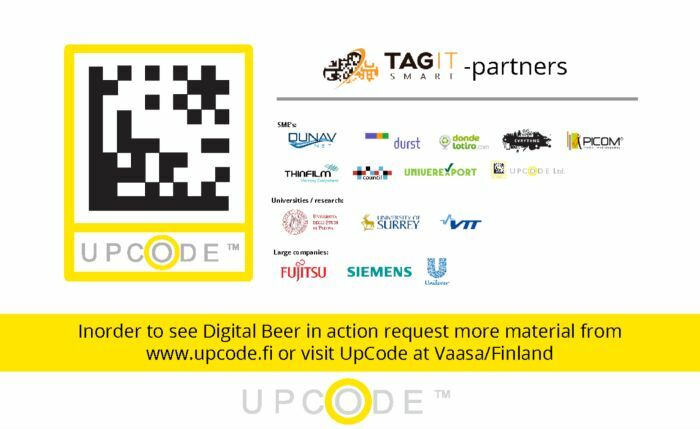 UpCode "Digital Beer" plays an important role in the project as a base use case and pilot product. UpCode knowledge in business solutions and tag management is a driving force in the "TagItSmart" project. 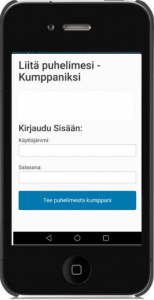 UpCode has made an agreement with Kouvolan Vesi for delivering a mobile information collection system. Kouvolan Vesi wants to develop real time monitoring of work time and at the same time meet reporting requirements from the tax authority. The solution is further complemented with a mobile driver’s logbook. TagItSmart! - Smart Tags driven service platform for enabling ecosystems of connected objects. UpStore Brand POS engagement system developed and tested in field 2016. The system is now ready for larger deployment. 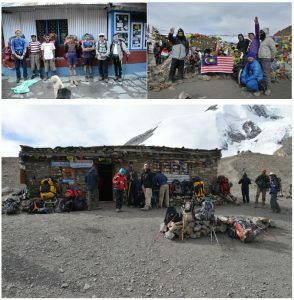 Our customer Lee Yaw On send greetings from Nepal, Mount Everest. “They are many circuits offered in Nepal. It is best to engage a Nepal local tour agent to organise the trip. fresh foods so that we would not get stomach upset / diarrhoea. (ICT-30-2015: Internet of Things and Platforms for Connected Smart Objects) call. Consortium, which includes 15 companies/universities around the EU (University of Surrey, Fujitsu, Siemens, Durst and VTT,etc…) received almost 7 millions euros funding for the next three years. Competition was tight in ICT-30 call, as 150 consortiums applied but only 7 were selected. With this funding consortium will develop smart, tags driven, service platform for enabling ecosystems of connected objects in project called TagItSmart. TagItSmart sets out to redefine the way we think of everyday mass-market objects not normally considered as part of an IoT ecosystem. These new smarter objects will dynamically change their status in response to a variety of factors and be seamlessly tracked during their lifecycle. This will change the way users-to-things interactions are viewed. UpCode’s role in this consortium is to provide its knowledge from optical code, mobile applications and platform development into consortiums use. hakuprosessissa(ICT-30-2015: Internet of Things and Platforms for Connected Smart Objects). Yhteenlittymä, joka koostuu 15 yliopistosta/yrityksestä EU:n alueelta mm. Surreyn yliopisto, Fujitsu, Siemens, Durst ja VTT, valittiin 150 hakemuksen joukosta 7 rahoitusta saavaan joukkoon. Yhteensä yhteenliittymälle myönnettiin 7 miljoonan euron rahoitus seuraavalla kolmelle vuodelle. Tämän rahoituksen turvin yhteenliittymä kehittää älykkään, koodeihin pohjautuvan, palvelualustan (TagItSmart) joka toimii ekosysteeminä älykkäille objekteille. TagItSmart tuo Internet of Things (IoT) –pohjaisen ajattelutavan massamarkkinoille, tuotteisiin joiden ei aikaisemmin ole ajateltu kuuluvan IoT-maailmaan. Nämä uudet älykkäämmät objektit muuttavat dynaamisesti tilaansa riippuen erilaisista ympäristötekijöistä kuin myös tuotteen elinkaarivaiheesta. TagItSmart muuttaa käsityksemme tuotteen käyttäjän välisestä vuorovaikutusta. UpCoden rooli yhteenlittymässä on toimia kooditeknologia-, mobiliisovellus- ja järjestemäasiantuntijana. 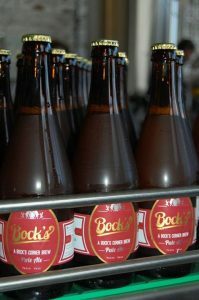 UpCode is being implemented at the new Bock's Corner Brewery. The codes are seen on bottles and offer interesting information for the wide audience. UpCode is also going to be used in the production for tracking and item level control. Our customer Skaala Windows & Doors is expanding the usage of UpCode systems to also other countries. The UpCode business is growing and we are therefore looking for an experienced system developer. The job includes planning and implementation of testing procedures (also system testing) and planning of databases as well as extensive SQL- programming. We offer a possibility to work in international projects, a varying job and an innovating work environment. The mobile solution for work safety observations on construction sites has been further developed. MVR-Mittari (ground and water construction sites) now also available. Työkuvaan kuuluu testauksen suunnittelua ja toteutusta (myös järjestelmätestausta) sekä tietokantojen suunnittelua ja vaativaa SQL ohjelmointia. Tarjoamme mahdollisuuden työskennellä kansainvälisissä projekteissa, vaihtelevaa työtä sekä innovatiivista työympäristöä. The project Välittämisen koodi will be presented on March 10th at Rytmikorjaamo in Seinäjoki. The new model for supporting youngsters will be presented. Different experts will talk about preventing social exlusion and about the power of cooperation. Future users will also be guided on how to start using the system. We were very busy at the end of 2014, we finalized and delivered solutions for many of our important customers. We are looking forwards to a successful year also 2015. Happy New Year! Etsimämme henkilö tulee työskentelemään pääasiassa UpCode tiimissä palvelimien ja tietoliikenteen parissa sekä helpdesk tehtävissä, mutta vastaa myös koko UPC Konsultoinnin sisäisen tietoliikenteen ja infrastruktuurin ylläpidosta. Työtehtäviin sisältyy mm. : virtuaalialustojen korkean käytettävyyden varmistaminen, järjestelmien ylläpito ja hallinta, ongelmien selvittely sekä palvelujen kehittäminen. - Suomen, Ruotsin ja Englannin kielen taitoa. UpCode is constantly developing the system for reporting of construction work. The system can be used for reporting directly to tax authorities according to the Finnish requirements. It is an efficient time saving system regardless if your main business is constructing or if you just occasionally build or undertake maintenance work that should be reported. We can now offer the system for both reporting workers and contract sums. The website for the projekt Välittämisen koodi has been published. www.välittämisenkoodi.fi. The system that is developed will support different authorites and the third sector in supporting children and young people. It will help in the preventing work against social exclusion. The project Välittämisen Koodi is presented at the Know How exhibition in Vaasa (Bothnia arenas) November 19th-20th. UpCode has been implementing solutions for the construction business over the years and has today an entire product family optimized for construction business. 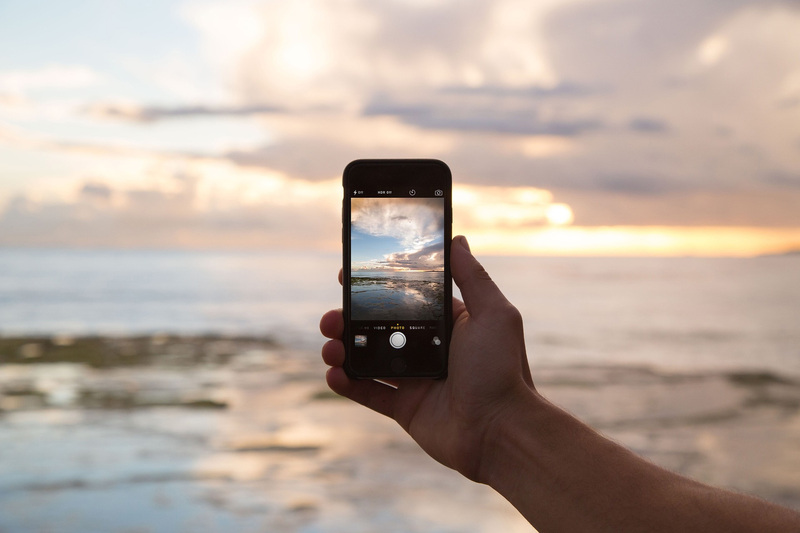 It includes mobile security measurement (TR/MVR mittaus), mobile work time and process reporting as well as a solution that gathers and sends information directly to the Finnish tax authorities. UpCode customers within the construction business are SRV Yhtiöt Oyj, Skaala Oy and Vaasan Vesi. Tarjoamme mahdollisuutta työskennellä kansainvälisissä projekteissa, vaihtelevaa työtä sekä innovatiivista työympäristöä. UpCode offers optimized mobile tools for construction sites, including mobile saftey measurement (TR-Mittaus), work management and pass control. UPC offers new media solutions, amongst other things we offer combining of media to products. Vaasan Vesi (region water provider) has been using the UpCode people flow management system a couple of years and is now expanding their system to cover also everyday work on the field. Our customer Skaala Ikkunat ja Ovet Oy is a forerunner in many ways and is now expanding the UpCode system within work force management. UpCode was visited by a delegation that studied the possibilites of implementing eEducation and eHealth solutions in SouthAfrica. UPC received an order for evaluating the value of using information as a strategy in enhancement of GDP growth in the regions of Ostrobothina and Westerbothnia. UpCode offers new system for confirmation of code location. Contact us for more information. UpCode Ltd. partners with SICPA SA, University of Surrey, VTT Technical Research Centre of Finland, Everything Ltd. and Universita degli Studi di padova in developing product identification and security applications including sensor functionality. 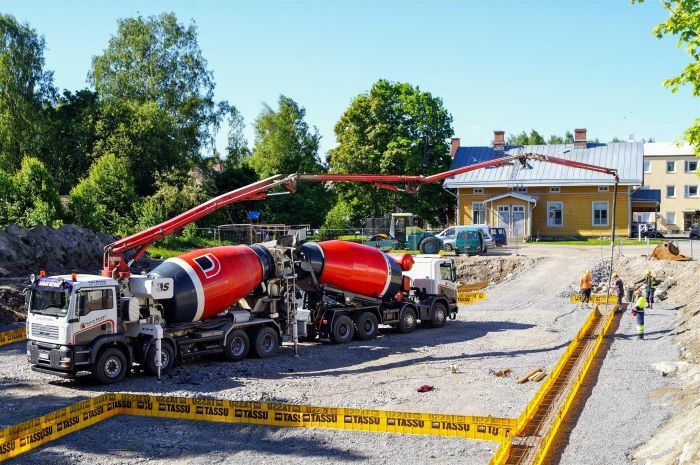 UpCode now offers an AutoReporting system for companies obliged by the Finnish information reporting requirement in the construction sector. It will be possible to gather the required information about the construction workers with the help of mobile technology, but it will also be possible to implement other solutions that will give the companies much added value. UpCode is part of the open environment ecosystem in millions of use cases in over 150 countries. It is completely free to use UpCode in that way. Using codes in advertisement and packaging has become very common around the world. For more advanced use there are professional UpCode tools available. We have been honored by interesting visits during the last couple of days. 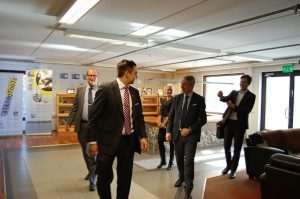 Yesterday Minister for International Development Pekka Haavisto visited UPC Center, accompanied by also the Mayor of Vaasa Tomas Häyry. Last Friday Leo Suomaa Director- General from the Ministry of Social Affairs and Health visited together with representatives from the Regional State Administrative Agency. The Minister of Trade in Algeria approved a press conference regarding the new UpCoded trade register in Algeria on Sunday, March 16th. New negotiations in several African countries, specially regarding UpCare healthcare solutions. UpCode CEO Sture Udd is an invited speaker for Retail & Innovation at the global IDWorld Sustainability Summit in Abu Dhabi February 24-25th, 2014. He will also function as Chairman of the Resource Management Session and the Urban Security & Mobility session. The summit is endorsed by European Commission and Emirates Identity Authority and a part of the Future Cities program. UpCode codes can now be found on the packaging of Snellman products. Via the code the user can check origin and get tips. UPC Center developed new printed information product and links to SuperMedia cardsolution. MegaCard is demonstrated and in function. UpCode's CEO Sture Udd is travelling to Africa in a business delegation lead by Prime Minister Katainen and Minister for International Development Haavisto. Government Communications Department press release. UpCode has together with the Regional State Administrative agency (LSSAVI) and the South Ostrobothnia Health care district (EPSHP) finished a project plan for developing a system (Välittämisen koodi) that helps different authorities notice youngsters in need of help. You are capable and willing to constantly develop yourself and learn new things. You are interested in mobile technology and server solutions. You have at least 1 years experience in system development (programming). Finnish. We are looking for good team workers with ability to take responsibility and also work independently. We offer a changing work environment, interesting and value creating projects in a young and creative team. Article about UpCode was published in the Finnish magazine Teknologia, talous ja työelämä. Click to see the article. UpCode was awarded for Smart City concept at Electronica 2013. Click here to read a news article in Swedish. UpCode got the honor to develop an authentication system for the national trade register in Alger. The meat producer SNELLMAN & UpCode start to develop the next generation of intelligent packaging. UpCode CEO Mr. Sture Udd chairs healthcare innovation group at Abu Dhabi IDworld congress. Varte Oy uses UpCodes in their marketing for apartments. Upcode sensor technology advanced to stage of practical implementation. Skaala - a leading company in its field in the Nordic countries - heading for the first full mobile integrated system incorporating all functions in the company: 3 out of 9 partsystem under implementation.